Many entrepreneurs interested in Missouri’s new medical marijuana law are asking themselves, “When does the law take effect?”. The answer is, it already has. But there are several other deadlines that enterprising businesspersons and investors should know about. New Article XVI, Section 1 of the Missouri Constitution, entitled “Right to Access Medical Marijuana,” took effect on December 6, 2018. It creates five types of business ventures for the provision of medical marijuana services: Cultivation Facilities, Dispensary Facilities, Marijuana-Infused Products Manufacturing Facilities, Testing Facilities, and Transportation Providers. The new law includes a process to ensure that applications are promptly considered and licenses issued without delay. Applications must be approved or denied within 150 days of submission. The Department’s duty to approve or deny is described as “non-discretionary.” If the Department fails to do so, an applicant may “immediately” seek a court order compelling a decision on the license application. The proponents of the new medical marijuana law took care to ensure that the industry gets up and running as quickly as possible. That means interested entrepreneurs must move quickly too. AEGIS Law is a leader in working with cannabis industry clients in other states. 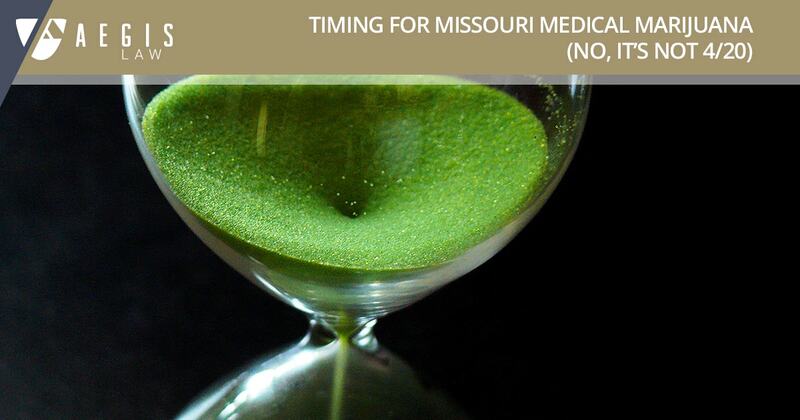 If you are interested in becoming part of the emerging medical marijuana industry in Missouri, contact Jeffrey Wax (jwax@aegislaw.com) AEGIS Law for help today.